← Would You Apply a ‘Dislike’ to Your Co-Workers’ Content? Would Twitter Have Emerged If Current Pessimistic Attitudes Were Around Last Year? Although well-used by many and even relied upon by some, Twitter has yet to turn on a revenue model. It’s not like the company would lose users, if it set up a minor advertising strategy as a test; people want to see the company make some money. Please, Twitter, turn on the revenue before it’s too late. Rafe Needleman, 11 troubled Web companies: The next Kozmos? We’re all watching, rather helplessly, what is happening to the global economy right now. It appears we’re in for a chilly period economically. Click here for a Twitter search on recession. The above slide is the equivalent of a cold splash of water in the face. The general theme seems to be: cut back on experimentation and things that take a while to mature. But that advice seems to be for companies that have a specific profile. I think the approach for entrepreneurs is a little more nuanced. The graph below graphs the two levels affecting cash flow, and considers the distance between a company’s revenues and its costs. I put this graph together because I think it’s too simplistic to say, “cut costs”. Cutting costs is advice that applies to companies along all levels of maturity in down economic times. But for many companies, that’s not enough. If the distance between sales and costs is too great, there’s no way to cut costs to preserve the company. 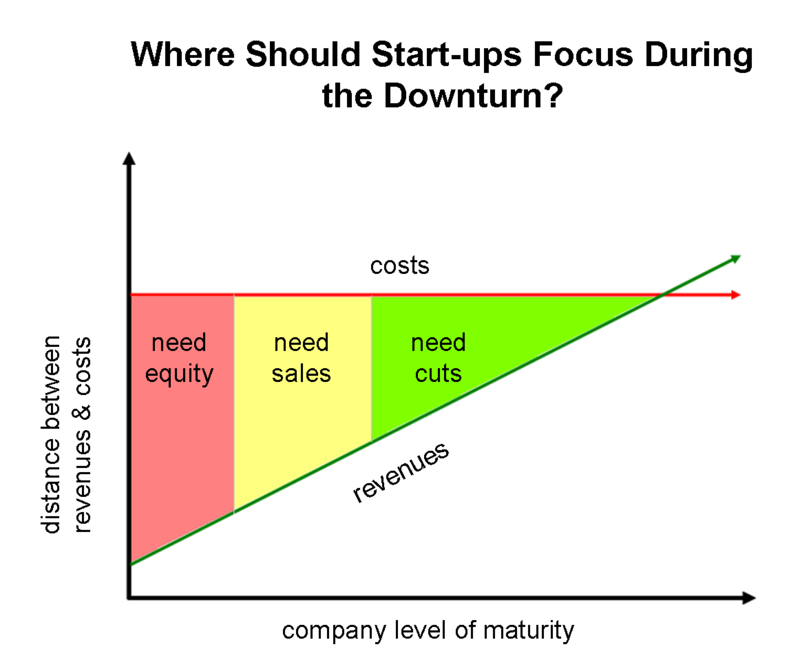 The focus of the entrepreneurs needs to be on raising equity, not doing more with less. If there’s a good base of revenues and a decent post-financial crisis pipeline, the focus is on closing deals, not cutting costs. 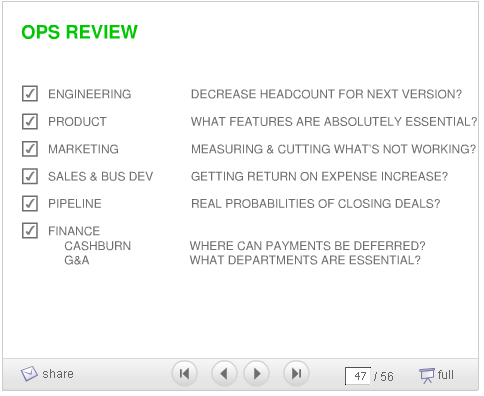 “Deals” meaning partner deals in a consumer web app, client deals for an enterprise app. But…aren’t those examples of experimentation? For instance, Flickr didn’t start out life as a social photo sharing service. It was an experimental feature for an online gaming service called Game Neverending by Ludicorp. The “feature” of photo sharing didn’t have a revenue model, and I’m going to guess it wasn’t the core strategy discussed at Ludicorp board meetings. Would We Have Twitter If the Economic Slowdown Was in 2007? I put together a two graphs of Twitter’s traffic, as tracked by Google Trends. 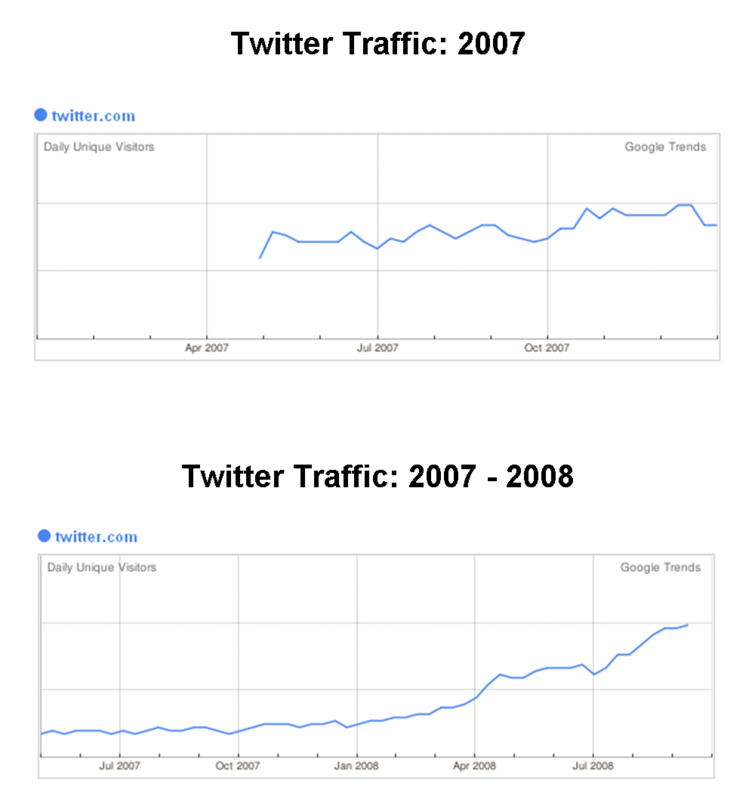 The top graph is Twitter’s traffic during 2007. The bottom graph is Twitter’s traffic overall from 2007 until today. Assume today’s chilled economic outlook was in effect at this time last year. If a VC was making decisions about companies in its portfolio, how would Twitter fare? The 2007 numbers show a service without a real growth trend. And Twitter still doesn’t have a revenue model. Using Sequoia’s advice…Twitter would be dead. But look at Twitter’s numbers starting in April 2008. The network effects have kicked in, Twitter is getting press everywhere, CNN is even using it. Per Rafe’s post cited at the top, an ad revenue model certainly seems doable and promising based on its metrics. However, I’m not convinced Twitter would survive under today’s dire outlook for start-ups. It’d be a victim of the “throw the baby out with the bath water” mentality we’re seeing right now. And wouldn’t that have been a mistake. Let’s hope some sense of proportionality and a longer term view kicks in soon. 2 Responses to Would Twitter Have Emerged If Current Pessimistic Attitudes Were Around Last Year? If Twitter went under tomorrow, who would take its place? Could a decentralized community of enthusiastic users replicate Twitter without major funding?